Escape From Tomorrow is a typical low-budget indie film in many ways: The actors aren't famous, and at times, it's painfully apparent why; certain shots are so obviously blue-screened that you wonder how the filmmakers even bothered; and the cheap special effects makeup includes colored contacts you could purchase at Hot Topic. 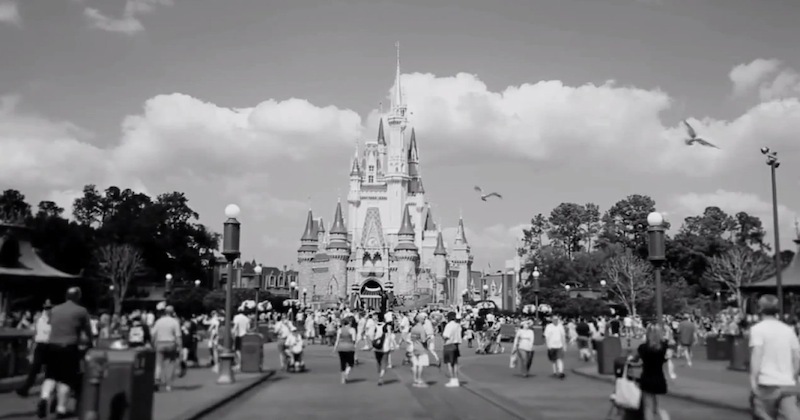 There is one thing, though, that makes Escape From Tomorrow unique, and it’s the film’s most salient detail: It was secretly shot in Disney World. Director Randy Moore and his team used a handheld Canon camera, natural lighting and pocket-sized Olympus voice recorders to surreptitiously film in The Happiest Place on Earth. Escape isn't the first movie to shoot inside Disney World, but it is the first one to do so in secret. And Disney World isn’t just the backdrop; the film’s entire plot rests on it. A typical American family is on vacation at Disney World when Jim, the father, learns that he has been fired. At first, it appears that Jim is just a bit rattled by the news — he snaps at his son, rolls his eyes behind his wife’s back and drags his feet through the park, complaining about lines, humidity and crowds. But it’s during “It’s a Small World” that Jim begins to have delusions that his son and wife are out to hurt him. From that point on, Jim’s problems are no longer of the it’s-hot-and-there-are-40,000-people-here variety. He finds himself dealing with an obese man on a scooter who wants to kill him, a former Disney princess who kidnaps his daughter and the cat flu, a deadly disease that has taken over the world. The issue of copyright is trickier than Jim’s psychosis. The official Escape From Tomorrow website features a clock counting the “Number of Hours Since Release That We Haven’t Been Sued” because although Escape does cut out certain copyrighted material, there is still plenty of Disney imagery on film. And no matter how engrossed you become while watching, part of you remains wondering how Moore could possibly get away with including Buzz Lightyear, Goofy and Ariel in his movie. Disney has yet to publicly acknowledge Escape From Tomorrow, and some commentators have speculated that it’s likely because parody falls under fair use in copyright law — and a Disney princess cracking the spine of a child could easily be considered parody. I recently spoke with Director Randy Moore over the phone and asked him about his inspiration for the film, the future of filmmaking and the times he was nearly busted shooting Escape From Tomorrow. Michelle King: You've spoken in previous interviews about how your own family and upbringing was the chief influence for this film. Can you elaborate on that? Randy Moore: When my parents got divorced, dad moved to Orlando, so I would go visit him in the summer, just by myself. We'd go to the parks pretty regularly. It became our ritual, and I enjoyed it a lot when I was a kid. At some point, in my mind, dad lived in Disney World. Mom lived in Chicago, dad lived in Disney. So my feelings towards Disney and my dad were intermingled to the point where they were merged into one. When I thought of him, I'd think of Disney; when I'd think of Disney, I'd think of him. When I got older, I didn't go back there for a while, not until I had kids of my own. When I did go back, all these emotions and memories came back at me really hard. It was almost like I was in a time machine and I was a 10-year-old boy again. It was very, very surreal. I was there with my wife, who had never been there before. She's not from the U.S., so she didn't have the connection to or nostalgia for the park that I had, and she was just having a miserable time. She turned to me and said, "This is worse than working the psych ward at the hospital." And I remember being really upset with her, like, "How dare you say something bad about this place!" But then I started to try and remove myself from it a little bit and look at it through her eyes. That's when I started to see the cracks in the veneer. Do you think that Disney World has grown into something that Disney himself wouldn't necessarily approve of? Oh, yeah. You know, a lot of people say they don't like Epcot, but Epcot was always my favorite part as a kid. I was into all the technology and space. I liked the futurism of it. I really liked Epcot, and that was why even though we could have done the movie completely in Anaheim, I decided to film in Florida. I wanted Epcot to play a part in the movie, so that's why we went to Orlando for 11 days first and then went to Anaheim. Was there ever a time when you almost got caught? Yes. So we scheduled the shots that were the most difficult to get first in order to get them out of the way. There was one shot that we thought would be pretty easy to do: It's a shot that's not in the final version of the film, where the family enters the park through the turnstiles. We had to get multiple angles of them entering, so they'd enter and exit, and enter and exit. They did that three times. At one point, a security guard walked over to them and asked them why they had entered and exited three times. The lead actor said he forgot his sunscreen, and then they said, "Well, are you celebrities?" They said, "No. Why?" [The guard] continued by saying, "Because you have paparazzi following you right now." And so the family said, "No. We have no idea who those people are." But [the guards] didn't really believe them. They pulled them aside to this area on Main Street and said, "Well, wait here while we check on something." When that happened either the little boy or the little girl in the movie said they needed to go to the bathroom, and then the other one said they also did. So security said, "Alright. Take your kids to the bathroom, but when you’re done come right back." They went to the bathroom, they removed their sound equipment, and when they came out, a parade was coming by. That sort of separated them from security on the other side. We had a P.A. whisper to them, "Go out. There's a van waiting for you by the entrance." They went back out through the turnstiles, got into our production van, and we sped off. That was the last day we shot with cast inside the park. What were some of the most difficult scenes to film? You have scenes where the park is pretty much empty. Were those scenes harder to film than the ones where you were dealing with thousands and thousands of unknowing extras? I think the hardest scenes to film were just the ones with the actors inside the park, especially when they were having an argument — and not because we were drawing attention, but because it's hard to direct when there's so much chaos going on around you. The scenes where the parks were empty, those were difficult because we had to wake up early and get to the park first. But to work with the actors when it's loud and noisy and hot, that was the most difficult aspect of shooting. The film has so much packed into it, and there's so much that can be said about Disney. How did you narrow it down to this story with these characters? You know, I think it just came from experiences I had going there as a child, and also my experiences as an adult. I went back there a few times when writing the script. What stuck out to me as the most troubling thing was going there and seeing the employees. They're so happy. At first you think, "Oh, that's so nice, kind of cute." Then you think, "Oh, they're trying too hard." But then it gets kind of weird. And then it gets kind of upsetting. At some point, you get angry. You're like, "Please stop being so nice." You start to see the forced smiles as demented. I started thinking about, gosh, what are the long-term effects of that? Were you considering issues of copyright while making the film or was that an issue that was dealt with when production ceased? For me, it wasn't a movie starring Mickey Mouse. It's more about what Mickey and those characters mean to the culture. I felt that these character and these locations are ingrained in our national psyche. Those parks have transcended being just another theme park. I think more people go there than to Washington, D.C. It's like a pilgrimage. That company plays such a large part in our culture, to not be able to critique it or parody it or criticize it is just morally wrong. So I went at it from a moral standpoint and thought, "When it's done, I'll talk to lawyers about it." But I didn't want to do that before it was done. I didn't want to second guess myself or, you know, not do things that maybe would be problematic later. I knew that if I started making the film that way I'd get into trouble. I wanted it to come from me, not legal discussions. Do you think that this method of filmmaking is indicative of the future of filmmaking? I think so. With these cameras and with laptops, people are able to make films that look as good as Hollywood films. Technology has really leveled the playing field. Coppola — and I'm not the first person to say this, obviously — Coppola and many, many other people have said that this is coming and that anybody will be able to make a movie. I think there's going to be a lot of really interesting stuff coming out pretty soon.